I will say that the UI is definitely going to be reworked a bit - it's coming. I think all the HUD stuff will be put along the bottom, and then 'letterbox' the game so the UI doesn't go over it. Hmm... Given that monitors seem to tend toward the wider aspect ratios these days, have you considered putting the UI on the sides rather than the bottom? That way the play-area is diminished in the more spacious axis, where it's thus less of a loss. There is a lot of UI info to display - in our mockup, it should fit nicely along the bottom. Hotbars, buffs, combat log, etc. I don't think it will take up too much space, ultimately, but we'll see. If both sides are used, the amount of space available there should be similar, I think, to what's available at the bottom--although that does split the UI. Today we have a patch chock full of bug fixes and quality of life improvements, plus a smattering of art and UI upgrades. Lots of stuff related to shops, sorting, and the inventory screen, and helpful things for mouse users too. But even more notably, I'm introducing version 0.1 alpha of ITEM WORLD! Inspired by the Disgaea series, Item World is a way to go inside a piece of gear, generating a mini-dungeon on the fly (with unique map layouts) and upgrading the item if you can beat the boss. To enter Item World, you first need to find an Orb of Item World (placeholder name...) from champions or boss monsters. Use it in Riverstone Camp, then drop a piece of equipment (weapon, offhand, armor) to enter. Items pour out of monsters/chests instead of stacking now! New inventory hotbar - drag and droppable! * New tileset: cobblestone! Looking dope! * Dialog box UI borders! * Side areas no longer have monster spawning crystals. Clear the maps and you're done! * Several defense/attack down effects were multiplying their effect each turn. This has been fixed! * ITEM WORLD can now be found in Tangledeep! This is a way of powering up a piece of gear (weapons, armor, offhands), increasing its raw stats and possibly adding a new magic mod. Here's how it works. 1. Find an "Orb of Item World" (placeholder name...) which has a chance to drop from any champion. 2. Use the Orb in Riverstone camp. 3. Drop the piece of gear you want to enter. This creates a new mini-dungeon! Item world floors have a different open layout and interesting new challenges. Poison water fills each floor, but you can build planks with the Plank Builders you find. Crossing the water is not a death sentence but it will drain your life fast if you're not careful. 4. Reach the bottom of the Item World and defeat the ^ITEMBOSS^ to find an upgraded version of the item you dropped to spawn the world. Picking up the item exits the world! Each individual piece of gear can be upgraded up to 3 times! Also, you may find the mythical Goldfrog in Item World. What happens if you catch him?! NOTE: This is just the first iteration of the concept. Ultimately I want Item World to be even weirder! Re: Tangledeep: 16-bit roguelike dungeon crawler, 1 day left to hit KS stretch #4!!! A hotkey for consumables may prove very useful to me: I do sometimes forget my consumables, which may be made less likely by having them be visible on-screen. Regarding items spreading out out to adjacent squares, a minor suggestion, if I may: perhaps have them arc up, then back down, as they move: that might convey the idea of the items being thrown into the air and falling back to the ground, and add a little animation to those remaining in the monster's erstwhile tile. I have not been keeping up with the most recent builds--nevertheless I have the latest downloaded, and hope to play it soon, as per usual! This build has a major bug fix related to wandering monsters causing game errors, which is the main reason I'm pushing it out today. It also has a couple major gameplay-related changes and I'm interested in seeing how they play out. First, powerups have generally been made more useful and more frequent. You are more likely to find ones that you need, champions always drop them, and you can get two from a single monster. Also, you won't ever get powerups for a resource you're full on. These things should - in theory - make it easier for all jobs to use their abilities a bit more often. At the same time I've adjusted the monster-attracting gem in a way that may make the game harder. Previously, destroying the gem was almost always optimal so you could make a floor safe. Now, there will always be wandering monsters. However, destroying the gem (which is now "Monster Surpressing Crystal") will yield a larger reward of XP, JP, and gold. The tradeoff is that future wandering monsters will be a bit harder - maybe by 10-15%. Another key change is that destructibles can generally no longer spawn loot at the same level as the monsters you're fighting, with some exceptions (like gold chests). I think that fighting monsters should be the best source of loot to reward beating challenging encounters. There are other changes coming up too but for now, I wanted to get these into the world! * Ice Daggers champion mod now has a brief cooldown period. 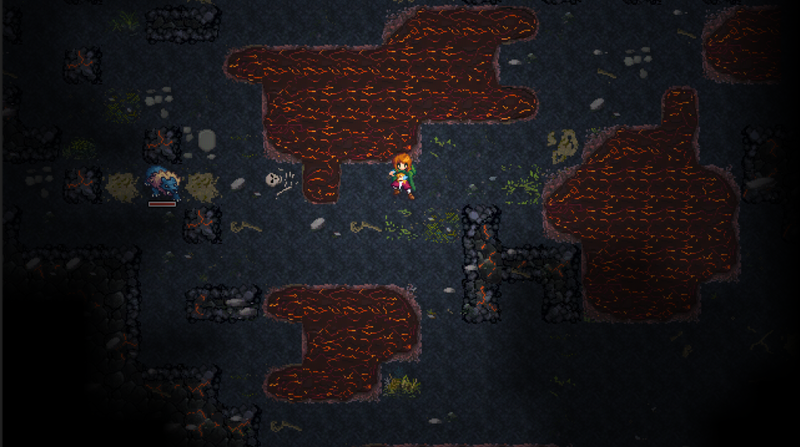 Also, they now spawn and move over collidable tiles. Also, they die with the champion. * The type of powerup that drops is now influenced by your resources missing/remaining. Also, if one resource is completely full but the other one isn't, you will always get a powerup of the missing resource. * New Rumor type: kill a handful of a specific type of monster using a specific element. * ITEM WORLD: Small chance of a special, particularly blinged out floor. * "Drop Item" is now a bindable hotkey, instead of being hardwired to "D"
* Added easter egg related to Budoka's "Arrow Catch"
Re: Tangledeep: 16-bit roguelike dungeon crawler! Kickstarter funded w/ 4 stretch! First, powerups have generally been made more useful and more frequent. You are more likely to find ones that you need, champions always drop them, and you can get two from a single monster. Also, you won't ever get powerups for a resource you're full on. These things should - in theory - make it easier for all jobs to use their abilities a bit more often. This looks fantastic! A bit sad I found your post right after your kickstarter ended, but I'll have to give some money on PayPal when I can to help out. Good luck on finishing up! Besides the usual round of bug fixes and QOL/polish, this build offers some new buffs to the Floramancer, Budoka, and Gambler, plus new weird stuff in Item World. Rumors and Medium Armor are also better/more unique now. All good stuff I think! Also, to expand on the reasoning for the wandering monster change I made last build: The issue with how I had it before was that players would destroy the crystal ASAP, because it was always the best option. There wasn't much decision making involved. This made it a lot easier to kite and hunt monsters one by one. This should be a valid tactic, but not one without risk, and if no new monsters spawn... there isn't a lot of risk involved. * Floramancer's Bed of Thorns can no longer be stacked on the same square(s), and can only trigger once per turn (per monster). However, it now does more damage. * Spellshaper now starts with a Simple Codex (offhand) instead of Chai Qi Cookies. * Floramancer: New ability, "Grow Spitting Plant". These are stationary turrets that have a ranged thorn attack with a chance to poison! * Floramancer: Improved Floraconda (1000jp + max unlocks) now has a Constrict attack instead of a ranged thorn. Constrict will root a target and cause damage over time. * Budoka: Hundred Fists, Qi Wave, and Palm Thrust all grant you a stacking defense boost for a brief time when used. * New armor mod: CONSTITUTION. Gives you a 20% chance to shrug off a negative status effect before it can be added. * New weapon type: STAVES (Staff). These ranged weapons (range: 3, shorter than bows) scale off a mix of Spirit and Swiftness, instead of just Swiftness like other ranged weapons. The Floramancer's starting weapon is now this type. Two additional staves can be found in the world. * There is now a short tutorial the first time you enter Tangledeep. Let me know what you think! * In item world, the water is now displayed as "poison water"
Now, destroying the crystal is worth even more, but it makes life a little harder, too. The choice is yours. I see your point, and indeed, I think that the crystal as it previously was didn't make for a particularly interesting decision. If this change fits your intentions for the game, then fair enough! In my case, I think that it still results in something that's more or less a non-decision, albeit a slightly more complex one: "always ignore the crystal until the floor is safe (by virtue of all monsters in that level running), then smash the crystal." However, this may well not be the case for other players! Tonight's build has some important key new features and changes that I'm eager to see in action. First is a rework of the main HUD. All of the key information has been placed along the bottom of the screen and cleaned up. The gameplay now centers on the hero and not the dead center of the screen, so you should no longer have cases where the UI covers up crucial game content. You can of course hide the hud with H still. This IS a work in progress and it will be improved more over time but it's a big step! Next we have level up bonuses. Previously, your core stats (Strength, Swiftness, etc.) rose slightly each level, between 1.3 to 1.75 points, based on your current job. Now, in addition to these bonuses, you can select a core stat to boost even more. This +3 stat boost is received on every level up. Over the course of even 5-6 levels this should help you customize your character further. I'm also trying to make sure that you can't screw up your character. All stats are useful to all characters, and there should be no "dump stats". 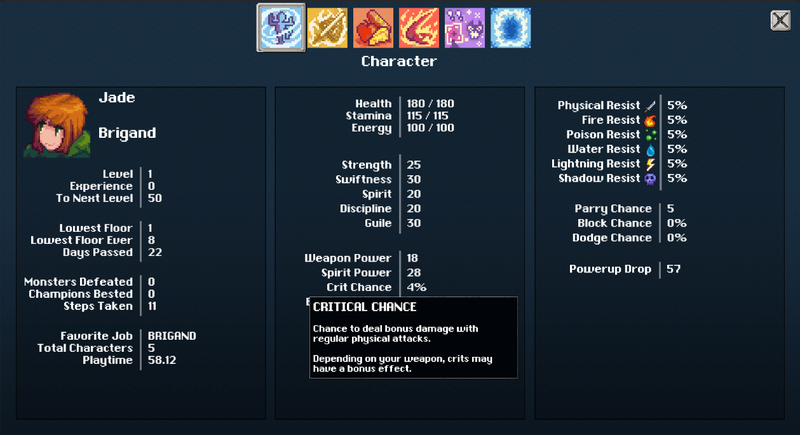 A melee fighter can still use Discipline for elemental resistance; a ranged fighter wants Spirit for powerup recovery and buff duration; a mage still enjoys the physical defense boost from Strength. Lastly there is the Monster Corral. The visual implementation here (a single placeholder shark NPC) is VERY INCOMPLETE as the corral will be integrated into the entire new town expansion map, coming soon. But the basic functionality is done. Buy (or find) a Monster Mallet, weaken a monster to <15% health, then knock it out with the mallet and bring it to the Corral. Monsters in the Corral have their own charming interactions and personalities. They also grant you combat bonuses against those specific monster species and their family. There's a lot more too but I'll just list the rest in the log! Knocking out a monster with the Monster Mallet. * Rework of main HUD UI, which (mostly) no longer blocks gameplay. Camera centers on character instead of screen. Can still be hidden with "H" as needed. * New Paladin and Spellshaper run cycles! * The "elemental kill" type rumor now allows for Physical damage. Also, it will ONLY give you an element that you have access to in your learned skills. NOTE: Wandering monster chance continues to scale based on initial monsters in level and # of killed monsters. For example, if you haven't killed any monsters, new ones won't spawn. If you've only killed one or two on a level, the spawn chance is much lower than if you've killed a whole bunch of them. * The MONSTER CORRAL (v0.5) has been added to the game! This currently lacks any visuals, but the functionality is there! Talk to the shark (placeholder) in town to learn more. In a nutshell: The Monster Corral is a place where you can bring a monster you've knocked out with a Monster Mallet (new item). You can have up to 3 monsters in the Corral. 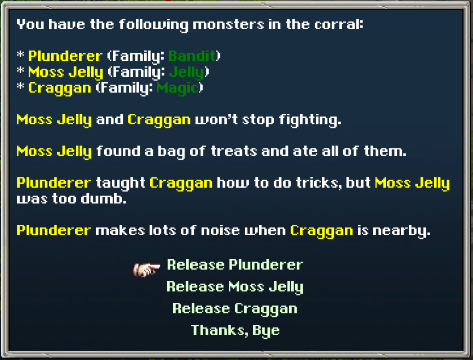 For each monster in the corral, you get a bonus while fighting them AND their family (less damage taken, more damage dealt.) This persists from character to character as well, just like the banker. * ITEM WORLD: There is now a chance that a floor will be full of monsters that are prone to attacking one another. * NEW CONSUMABLE: Butler's Bell. Summons a random assortment of food. * Abilities that proc on-attack effects (i.e. Qi Wave procs Thundering Lion), should now also check to CONSUME effects which are normally consumed by attacks. * GAMBLER: New effect for FLUSH (repeated through Full House, for now), massive haste! * Trying to move while rooted (if the root chance is 100%) will no longer take a turn. You can still attack nearby enemies while rooted, use abilities, and pass turns. * Your summoned pet will now show its name in the lower right, instead of the generic "Summoned Pet"
* Updated Monster Mallet's description to clarify that it does not work on champions or bosses. Magic trees can be planted in your GROVE, which is in the all-new town expansion (south of Riverstone Camp). Trees grow over in-game time, and continue to grow even when a character dies. As trees mature, they will begin to drop food as you play the game. This is a great way of stocking up on food items. 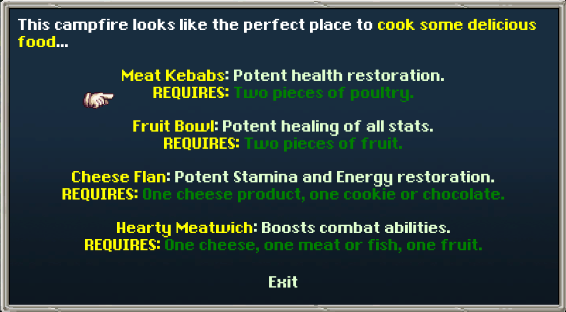 With 5 mature trees, you can expect a decent amount of food with each new character or floor you explore! BUT, you can also cut down trees for a quick XP + JP bonus. Another way to boost a fresh character OR help put you over the edge to the next level. To plant trees, you'll need to find magic seeds which drop rarely from common enemies, and more often from champions & bosses. Next, we have the cooking system which is still in its infancy with lots of possibilities ahead. Talk to the campfire in camp to see what recipes are available. Recipes are more powerful than normal food items, so when you want to maximize every turn in the dungeon, these are the best way to do it. More recipes will of course be coming! You can also enter accessory Item Worlds now, which can yield new magic mods and is guaranteed to give a boost to max Energy and Stamina. * Topaz Earrings no longer absorb lightning damage - they now reduce it significantly. * If you level up while another dialog is open, or you somehow gain multiple levels at once, you will still be able to boost your stats. You will just get multiple level up dialogs. * MAGIC TREES! Look for Magic Seeds in the dungeon (killing bosses or champions is a safe bet.) These can be planted in your tree grove, in the town expansion. Trees grow over time, and across multiple characters. They will produce food for you as in-game days pass. Or, chop them down for an XP & JP reward! Older trees = more XP and JP! * You can now enter ITEM WORLD of an Accessory. Upgraded accessories may get a random magic mod (as with other equipment), and will always get +5 max Stamina and +5 max Energy per upgrade. * Multiple save slots have been added! * NEW LIGHT ARMOR: Ivory Cloak. No dodge chance, but adds parry chance instead. * NEW MEDIUM ARMOR: Samurai Armor. Increases all damage output. * NEW HEAVY ARMOR: Mirror Plate. 25% chance to reflect magical projectile attacks. * NEW HEAVY ARMOR: Goldmail. 50% chance to resist any pull/push attempts. * NEW ACCESSORY (low lvl): Glowtorch. Boosts Fire and Lightning damage. * NEW CONSUMABLE: Shadow Shurikens. Strong single-target shadow damage at range. * Added a debug command to diagnose issues with line of sight - monsters being in sight when they should not be. Hold left bracket [ and tap A, then save+exit and send your output_log. * If you are wearing Knight Gloves, you will not auto equip offhand items. * The game now tracks playtime, both on a per-character and "meta" basis! Re: Tangledeep: 16-bit roguelike dungeon crawler! Now with magic trees! 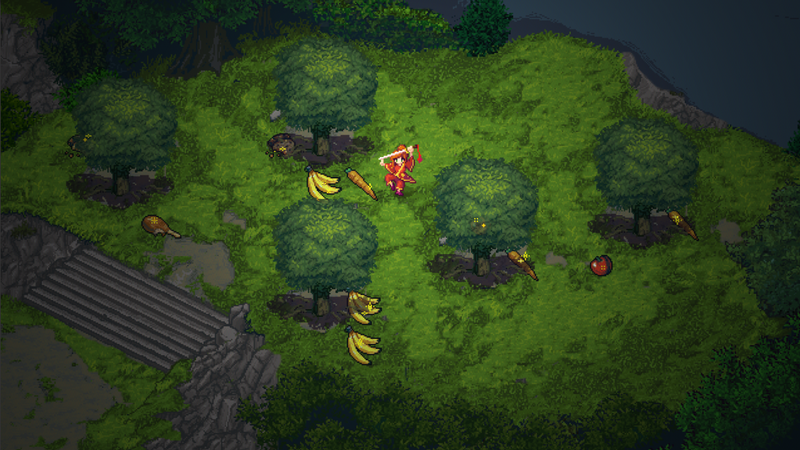 * When entering the town expansion, if any food is available in your grove, you can harvest it all at once. Now that we're in May I've been cleaning up lots of bugs... This is where the complexity of the engine I've built so far begins to rear its ugly head, as interconnected systems can produce all sorts of unwanted behaviors. Most of my focus over the last few days has strictly been bugfixing. However I've also created the first Legendary item - one of many! Legendary items are (naturally) both rare and quite powerful. They can't get normal "magic mods" like other items but they DO have unique effects you can't get anywhere else. Some will be generally useful by basically any job or build. Others will modify specific skills for certain classes, or even grant access to new skills altogether. Plus, legendaries CAN be upgraded in Item World! Massive, massive progress throughout the month - I'm really happy with how things are going. New side areas and quests, total UI overhaul, new input manager / in-game resolution switching, full controller support, LINUX builds are now working natively (! ), lots of new graphics, monsters... man, it's great! We're heading for an EARLY ACCESS launch in July - probably July 11th. Between now and then we're going to get the final leg of the game implemented, along with at least one new job and core animations for all characters. It's gonna be fun.